Miss playing sports, but don’t miss the commitment? Join an intramural team! Sports have always played a major role in my life. Ever since I was four, there was some sort of practice that I had to get to. Whether it was soccer, basketball, dance, swimming, or horseback riding, you name the sport and I probably played it. So, you can only imagine how lost I was once I got to college. A few months into my college experience and I was loving every second of it. However, I had this weird feeling that something was missing. I soon realized that I was lacking the competitive aspect that sports brought to my life. I no longer had the structure of a sports schedule and no longer experienced the adrenaline rush of a close game. I knew that I had to get involved somehow. I wanted to play a sport, but knew that I wouldn’t have the time to commit to a club team. 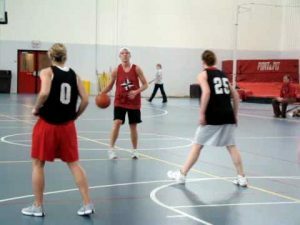 Therefore, I looked into intramural options. I discovered that it is a great way to stay active, be a part of a team, and meet new people! I found a few friends who were interested in putting together a soccer and basketball team, and we recruited a few strangers to play with us as well. All you have to do is sign up, come up with a team name, and show up at the games! Depending on how committed and intense your team is, you can even hold a few practices as well. Getting involved in intramural was definitely one of the best decisions I made freshman year and look forward to competing next year! Satisfying that late night food craving!